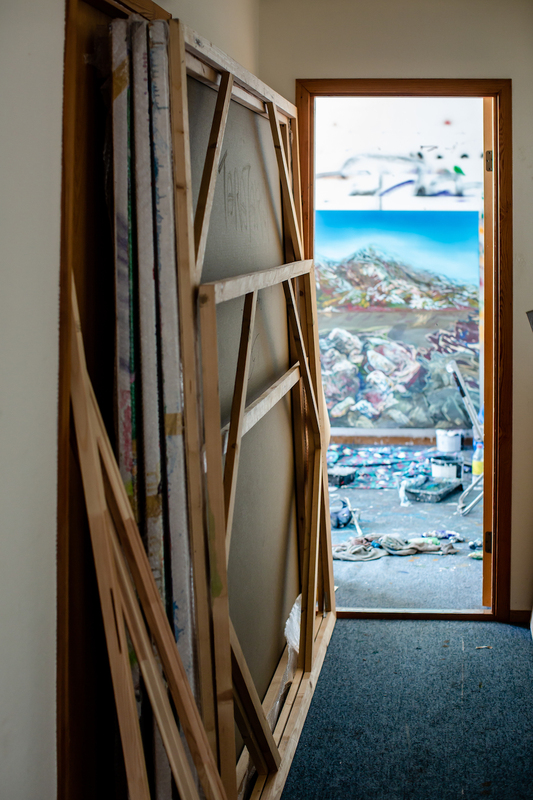 Art+Folk visited Manuel in his studio at Norsk Stålpress on a hot summers day. The space is made up of two rooms, a storage for completed big canvases and a bright working space with paint on every surface. 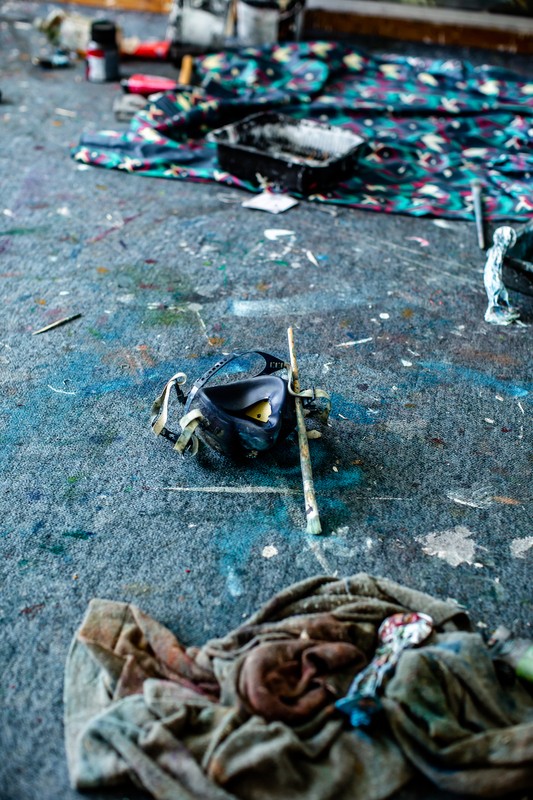 The smell of oil paint from several works in progress on the walls is almost overwhelming; we sit in this scene of prolific activity for the interview. The communication between Bergen and the rest of the world is good. That is something which doesn´t happen in Italy, that you have an international airport 20mins from the centre of such a small city. I don´t do thousands of exhibitions abroad, but when I need it, it is great to have the flexibility. There is a strong art community here which is surprising for the population. Bergen offers a lot; you can get everything done here, even if the shipping times are incredibly long. But we get everything we need here. It´s nice to have a community that you actually see and interact with. Most of my own art community is online, communicating with artists in other countries or using Instagram in an intelligent way to get relevant and interesting images. A+F: How has moving to Bergen influenced you? 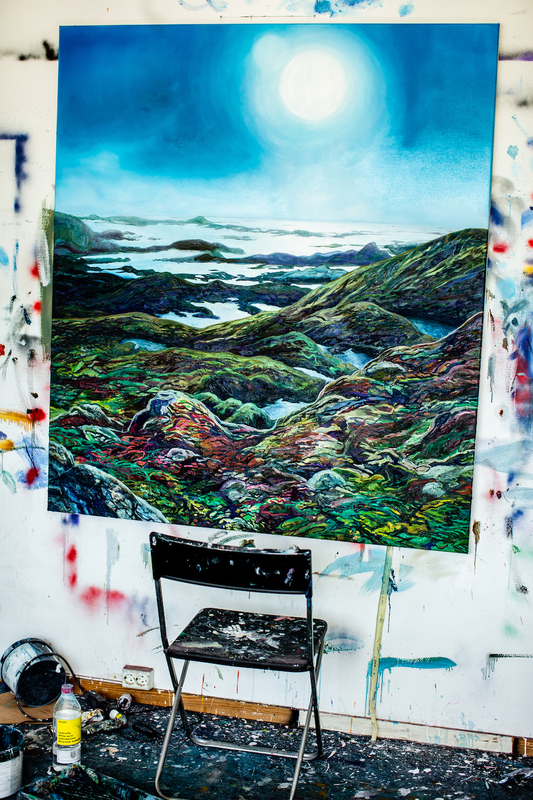 MP: I never painted landscapes before I came to Norway. I´ve been influenced by being here, I think it´s unavoidable. I came from a country that´s different to Norway in every possible aspect; different people, different culture, different economic situation, costumes, and ideas and ideals. One of the ways a person finds his way in a new place, is to become part of the surroundings so you have social interaction with people and you realise you are not in the flat landscape you are used to, but there are mountains and sea everywhere. When I was trying to decide what to do at the end of the master program, I started to have dreams of mountains and water. I know it sounds strange but I am not someone who dreams usually. At the same time I started painting landscapes, partly in the hope of fitting into the market here. I don´t remember if the dreams came before the landscapes or the landscapes after the dreams. I think it was something like the chicken and the egg. Probably they came along together. I was dreaming of water especially, the black Norwegian waters, it was so strange. But it hit me every night, so I felt like it was a weird message, so I just continued painting landscapes. I use them as a way to relax between more more demanding paintings. A+F: You have become part of other people´s art collections, how does that work with your practice? What is your relationship with art collection? You make series but you sell individual paintings separately. How does that feel? MP: Well I make series to make 10 paintings from one idea. Its hard to get enough fuel to make one painting, its better to spread it out. It takes a lot of energy. Sometimes an idea is too big to fit on one canvas. There are incredibly crowded paintings, like those by Hieronymus Bosch, but he took a year on one painting. If I want to live from painting I would need to charge a year’s wages for a single painting. I think of it as TV series rather than movies or as an album. I have the series as my portfolio, its fine if one or two actual paintings are not in my possession anymore. Every series needs a couple of hits and lighter and darker elements to balance it, just like an album. You have to balance a series and for me the work is the exhibition. 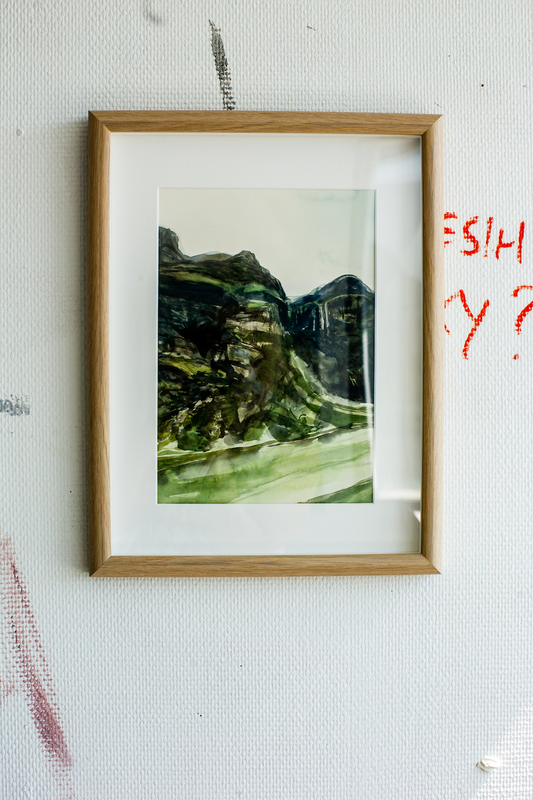 I had an exhibition at Visningsrommet called Lovers´ Nest. The finished work is the hanging and arranging the paintings together. A+F: Do you know the people who buy your paintings? Do you have a relationship with them? MP: Mostly not. Some people follow me on social media, some I have a bit of a relationship with. It would be nice to stay in touch with people and to know more about why they like the paintings. I like to think they appreciate the intellectual intentions and the material skill behind the work, but maybe they just like how well they fit with the sofa and the furnishings. That is ok. It would be hard for me to surround myself with paintings, they are work for me and I need to relax at home. A+F: Do you still have your gallery in Italy? Are you working between countries? MP: Yes, I am going to curate another edition of Cold Current with Helene Førde in the autumn. There will be an exhibition in September. A+F: Do you think your interest in curating is a way of collecting works, but in a way that you don´t own them? MP: I think you are right; I think that is how I make collections. I often admire other peoples works and curate exhibitions with things I like and think that its important for other people to see. 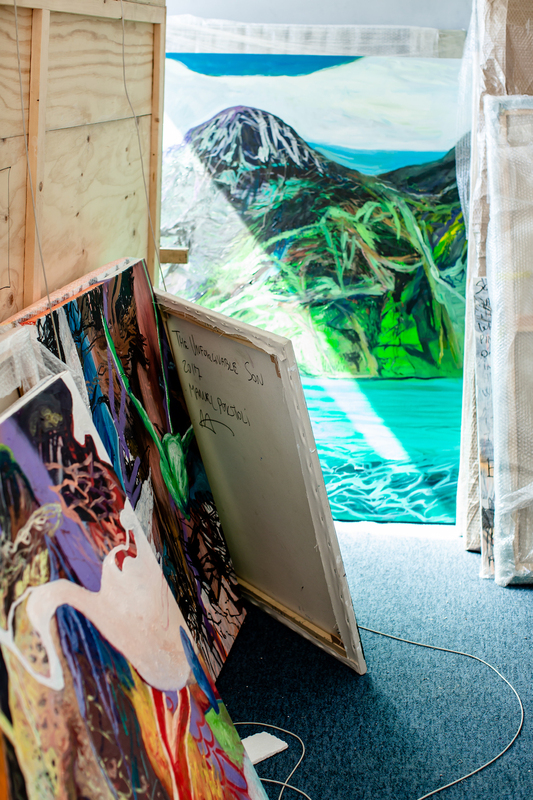 I do actually accidentally own some works from other people through curating, they are in storage in Italy, but it is because the artists never collected them after I organised exhibitions. It is nice to revisit the works now and then. A+F: How do split your time between earning money, studio work and free time? MP: It´s very random. My money job is very flexible, sometimes I only work a couple of times a week and sometimes very intensely. Sometimes I work more than fulltime in the studio and sometimes I don´t have a lot of energy and I will spend a few months away from the studio, reading books, watching movies, travelling, recharging. I prefer to take off time in the summer to be outside while its nice, but it doesn´t always happen that way. I don´t have a regular work day. I work both day and night shifts in my job. Last year I had a show coming up and I worked nights in my job and all day in the studio with just a few naps. It was very intense. Now I´m the manager so I can control my shifts, I check in most mornings to make sure everything is as it should be before I come to the studio and I try to be in the studio five times a week. 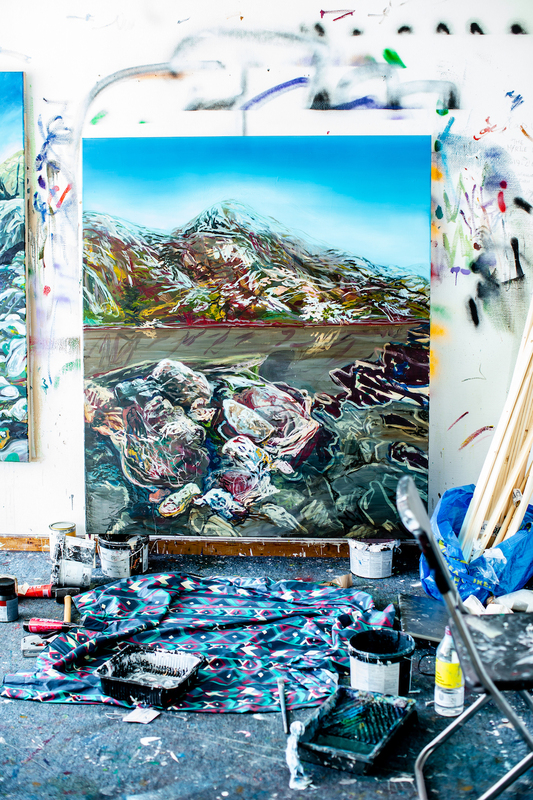 A+F: You are painting a lot of landscapes; do you also work outside the studio? MP: I go out to places and go up and down mountains as fast as possible to make it feel adventurous, while looking for the right scenery. I feel I´m going fast but probably any Norwegian pensioner would overtake me! I work from photographs back in the studio. I work with Photoshop and watercolours to sketch out the series. 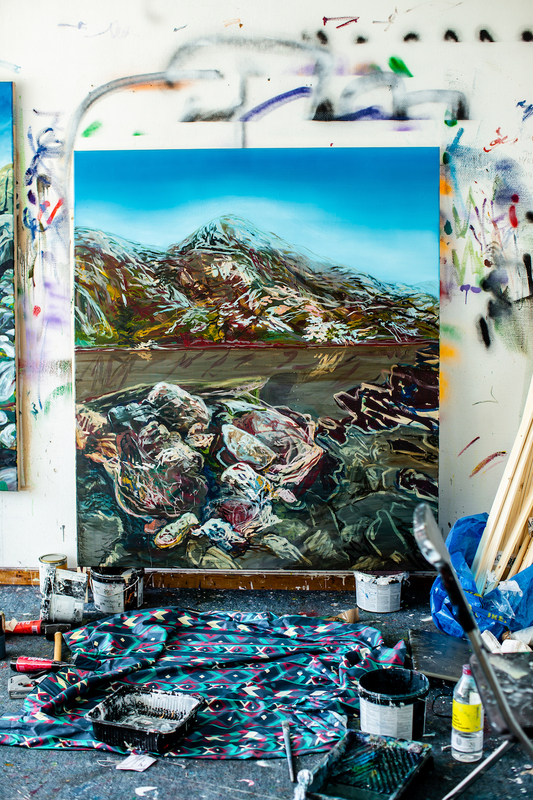 A+F: What new projects are you developing at the moment, are these landscapes for an exhibition? MP: Yes, they are for Solund Kunstlag they asked me to come and make some paintings. The landscape is amazing there. I will do an exhibition on the 25th August. I went there and explored for 2 days to take pictures to try and capture some of the rock formations they are famous for. Actually the paintings are too green, it looks too much like Bergen.